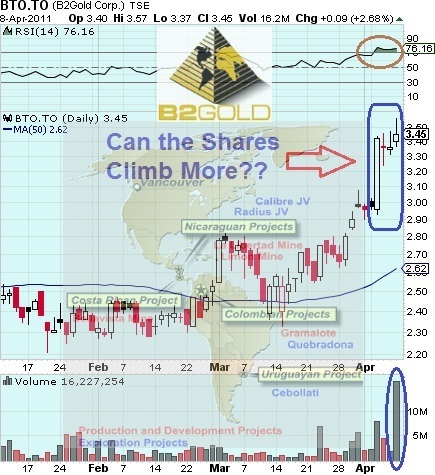 The dream for the B2Gold Corp. (TSE:BTO), (PINK:BGLPF) on the stock markets continues. The shares have never looked stronger. They have flown 35% up on the Toronto Stock Exchange (TSE) over the last three weeks. Last Friday, they marked an all-time price record on a huge turnover that made them the second most demanded item on the Canadian market. This does sound like a dream performance. In the last session, BTO added the next 2.7% to its value to close at $3.45. The stock noted a high of $3.57 during the day, a record in the company's trading history. The rise was confirmed by an enormous volume of over 16.2M shares, beating almost eight times the average turnover. * The corporation recorded a net income of $29.5M in 2010. In addition, it increased its proven and probable reserves by 16% over the last year. As the figures show, the positive trends from the financial statements also look like a dream. Perhaps, they have impressed many investors and are one of the reasons for the solid performance of the stock. The other probable reason is a speculative interest towards the company and possibly the increased shorters' activity. If there is anything negative to be said about B2Gold, this is probably the dilution - the average number of outstanding shares has jumped from 237M in 2009 to 313.6M in 2010, or by more than 32%. However, this has not prevented B2Gold from recording a very encouraging $0.09 EPS for 2010. Shareholders are probably delighted! Besides, the company promises investors 135,000 ounces gold production in 2011. Finally, we should note that the current market cap of the company is $1.17B (!!!) and is well above the net tangible worth of business. This suggests that the corporation is overvalued by traders.